Munich - There's just no let-up for 2012/13 UEFA Best Player in Europe and Ballon d'Or candidate . bundesliga.com: Franck Ribery, after beating FC Augsburg 3-0, FC Bayern surpassed Hamburger SV’s historic record (1981-83) to make it 37 consecutive [Bundesliga] games without defeat. How proud are you of that? 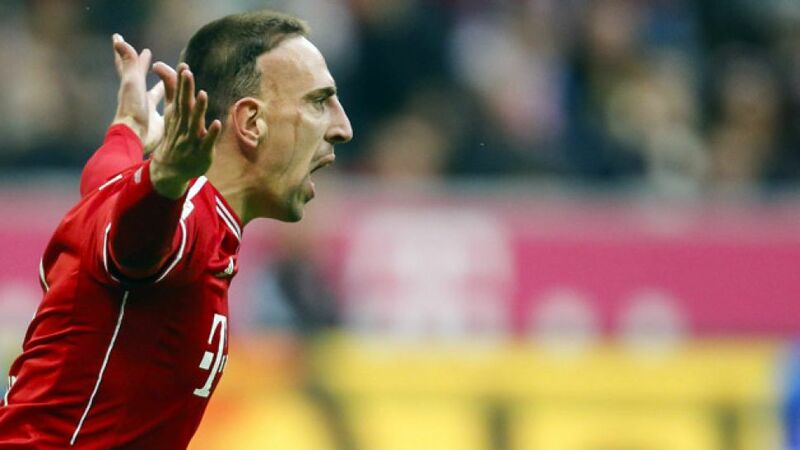 Franck Ribery: Every record is great. The good thing at Bayern is that we win almost every game and almost never lose. We’ll do all we can to keep this run going. Ribery: It’s definitely the game of the year. I’m really looking forward to it. If we win, we’ll be seven points ahead of BVB. That could prove decisive in the title race, even at this stage. bundesliga.com: What are the key tactics required to meet the challenge of playing in Dortmund? Ribery: We'll have to be very patient, not rush things and take our chances. Most of all we can't give the ball away because Dortmund are so strong on the counter. bundesliga.com: Do you know when you personally last lost a game with FC Bayern [in the Bundesliga]? Ribery: I honestly don’t. I’d have to think a long way back. bundesliga.com: It was in April 2012 in the 1-0 defeat at Dortmund. Ribery: (laughs) Well I can only hope that isn’t a bad omen for us. Ribery: Before I stepped up to take it, I had a really good feeling. Shooting was the only thing I was thinking about. Mario Götze told me to shoot low, but I decided on something else at the last moment and stuck with it, and I knew it was in. I saw a little gap to the right and that’s exactly where I put it. bundesliga.com: Are you thinking about the FIFA Ballon d'Or award in moments like these? Ribery: Yes, definitely. I'm always thinking about it during games. I know I have to keep playing as well as I can to win it. I want to keep having fun and play without pressure, but obviously I do really want this title. bundesliga.com: But your focus right now must be on France’s World Cup play-off against Ukraine. How much pressure are you under? Ribery: They're two unbelievably important games, for our national team as much as our country. The most important thing is to stick together. Solidarity is what we need to book our ticket to Brazil. bundesliga.com: How do you handle being France’s great white hope? Ribery: It’s never easy having to deal with such pressure, but I have lots of experience. It's all about making sure we continue to play well and come up with the goods when it matters most. I’m ready. bundesliga.com: What’s the mood like in the Equipe tricolore camp? Ribery: Very good. Winning our last three games on the spin has given us plenty of confidence. Now we want to press on against Ukraine. bundesliga.com: How do you rate Ukraine? Ribery: It certainly won’t be easy. None of us should think for a second that it’s going to be a comfortable two games, but we don't need to fear them. Otherwise we may as well stay at home. bundesliga.com: What would be the consequences of France not being at the World Cup? Ribery: That hasn’t even crossed my mind. For me, that's inconceivable. I’m sure we will punch our ticket to Brazil.